Get your Little Dragon today! 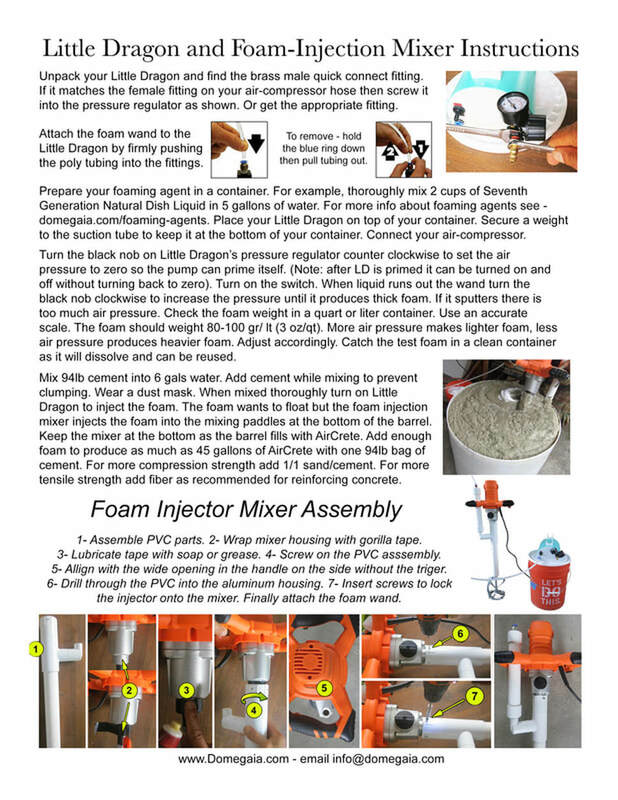 Little Dragon is a powerful, compact AirCrete foam generator. It features a high-pressure, self-priming, continuous duty Aquatec pump, pressure regulator and solenoid valves, with a dial indicator for easy and accurate adjustment. It fits conveniently on top a standard 5 gallon bucket and is very simple to operate. Put foaming agent in the 5 gals, hook up an air-compressor and you are ready to make AirCrete. For more information about foam agents click here. Our new Foam-Injection Mixer works wonders! Little Dragon injects foam directly into the mixing paddles. It's easy to mix the precise amount of ingredients for consistent results every time. Mix 6 gallons of water with one 94 lb bag of cement. After the cement and water are mixed add foam to your desired density. One bag of cement will make 45 gallons of light weight AirCrete in just a few minutes. You can also add sand, fiber or other admix ingredients if desired. 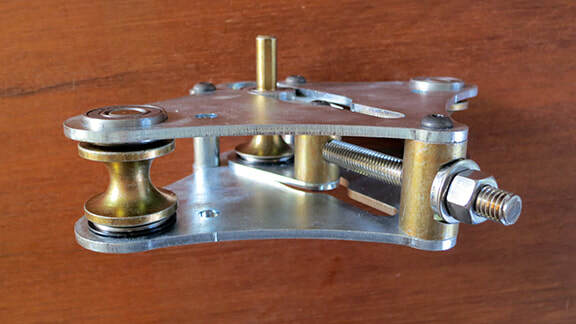 ​Bender is a precision tool designed for making forms for AirCrete arches, round window, oval doorways etc. Powered by a 1/2” drill, Bender takes only 15 seconds to complete a 20’ bend single handed. Bender comes with dies for 3/4" EMT, which is about 1" OD round. 3/4" EMT is our preferred material for making AirCrete forms. It's strong, zinc coated, readily available and inexpensive. ​​ Optional roller dies for 3/4" square tubing are also available. This is a video of our original Bender. Bender has evolved a lot since then. As you can see the original Bender worked well. Our new Bender works even better. Foam is light and wants to float on top of the mixture. With our foam injector ​the foam is injected into the mixing paddle at the bottom of the barrel. It makes it much easier and faster to mix. Mix a 94lb bag of cement to make 45 gallons of AirCrete in a few minutes. Our powerful Foam-Injection AirCrete Mixer features a 1600 watt variable speed motor, high and low speed gear box and locking switch. It's compact design, large mixing paddle and comfortable handle make for easy operations. Satisfaction Guaranteed! Find more products and workshops in our Store!